Blackfriars Bridge has rightly become a symbol for car-centric planning in London and the utter disregard of Transport for London and Boris Johnson for the real needs of cyclists in London. The redesign of the bridge and the planned increase of the speed limit for cars from 20 to 30 mph has been annoying cyclists for months. This comes despite the fact that two cyclists died on the Bridge in recent years and many more were injured by cars. Human-friendly version of Blackfriars Bridge. 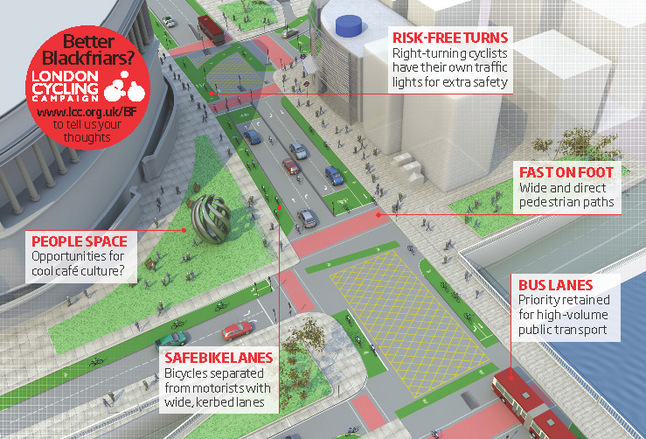 Two days before the next demonstration is going to happen – another “flashride” on 12 October, 6pm – London Cycling Campaign has revealed an alternative proposal for the road layout of the bridge. From my point of view, LCC’s proposal appears very sensible. If you share this impression, please join the flash ride next Wednesday (riders meet outside Doggetts pub at 5.45pm). It does seem a more sensible design- what I can’t understand is why it is so vital to cars for the speed limit to be raised by 10 mph in the middle of a city: it seems rather pointless as it only allows the cars to get to the next traffic lights half a second faster.